This German cottage quartz cuckoo clock accurately keeps time and plays 12 different melodies. 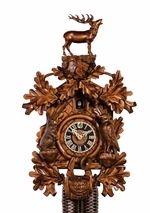 This clock features two deer figurines. Two decorative pine cone weights are suspended beneath the clock case by two chains. The pendulum swings back and forth. On every hour the cuckoo bird emerges from a swinging door above the clock dial and counts the hour by cuckooing once per hour. (Example: At one o'clock the bird will cuckoo once. At eight o'clock the bird will cuckoo eight times). After the cuckoo bird cuckoos one of 12 different melodies will play. 11. Love theme of the movie "The Godfather"